akuni requested black and white bamboo and a hummingbird with cherry blossoms and was willing to pay for postage, so I tried. It that one okay, Akuni? 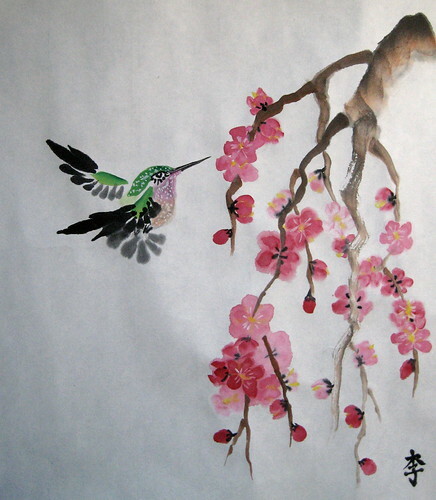 Then a first attempt at the hummingbird and cherry blossoms. I'm keeping this one for myself, the bird came out drabber than I liked, and the branch faded, but I like the placements a lot. Hope you like it, akuni. Wow, that last one in particular is *gorgeous*! *smiles* Thank you!! I'm glad you liked. Those are nifty and beautiful! Thank you, very much! I'm glad you like them. OH OH! Humming bird! YES! *beams* Yay!! I'm glad of the emphatic recognition of the bitty birds. Hee. I'm glad you like the bamboo, too. Yay!! Those are lovely, and the last one is absolutely beautiful. *smiles* Thank you! I keep trying. It's fun to try. ♥ Thank you, so much! Oh, those are awesome, especially the last one! I love how the "trunk" fades from dark to brown to grey, and the different pinks in the clusters of blossoms. The tree really looks like it has depth. And the bird is very cool too, the crisp black wingtips and then the speckled colors of the head and chest, and the almost Egyptian eye. Neat! Yeah, a lot of the wood effects have to do with loading both brown and black on the brush and letting the mingled colors just go... that's fun. The Bamboo on a Foggy Day is my favorite. It's so beautiful. 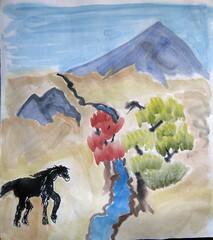 If I were recovering from something awful that painting would help me get well faster. What does the first picture symbolize for you? I've never seen you do a horse before. Yeah... horses... power. It's more the things I'd glimpsed while on the ride back from Alquequerque and I wanted to get the symbols of the ride down, the mountain and stream and trees... and the sky. I think I could do all of them better, eventually, but for now, I wanted to just catch the ideas. Dear gods *stares* The bird is absolutely, incredibly GORGEOUS. I swear, it's awesome! That's just... Wow. Hee. I'm glad you like it so much! I saw them on dA this morning, and I was so excited. I'm going to change what I said on the first hummingbird pic - I was looking on my EeePC so I didn't really get to see the full thing properly. I think the layout is actually pretty great. I hope you have room left on your walls to put it up somewhere, heehee! Yay!! I'm very glad that you like it so much! Excellent! I'm glad that I can get them to you. 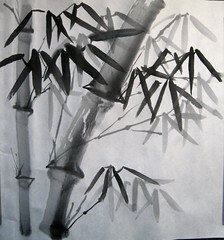 I love the black and white bamboo, but, hehe, of course I do. I always love those. You do them so well. 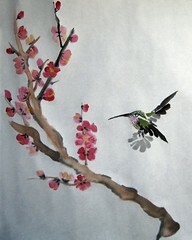 I also like the cherry blossoms in both and the humming bird in the second is fantastic. XD Really beautiful work. Neat that you like the second, too! *laughs* I love your icon for this.